Let me start off by saying that it is only on very, very rare occasions that Vaseline or any form of petroleum jelly comes in contact with my skin. Especially when I'm looking for something that will repair and sooth. That's where these two beauties come in, and surprise, surprise they're both French! First we have Nuxe Rêve de Miel Ultra-nourishing Lip Balm. I've seen a number of the British bloggers (like essiebutton and ViviannaDoesMakeup) talk about this and when I was on a bit of a pharmacy splurge I picked it up. It's just under €12, which might seem costly, but I assure you that it's more than worth it. I don't carry it around with me, it sits contently (in its box because I am a freak) on my bedside table and I apply some every night. The consistency is slightly strange, feeling a bit grainy, but it smooths over your lips and settles down. It has honey and precious oils, which you can really smell in the product. It's sweet but not sickly. I wake up in the morning with perfectly smooth lips, no redness or chapping. If they were particularly bad I can reapply in the morning if I'm not planning on wearing lipstick. The effects last for hours and so far I've hardly made a dent in the product despite having it for months at this stage. The second lip-savior is La Roche-Posay Cicaplast Baume B5. This is a recent edition to my bedside table but already I know I'm never going to let it go. 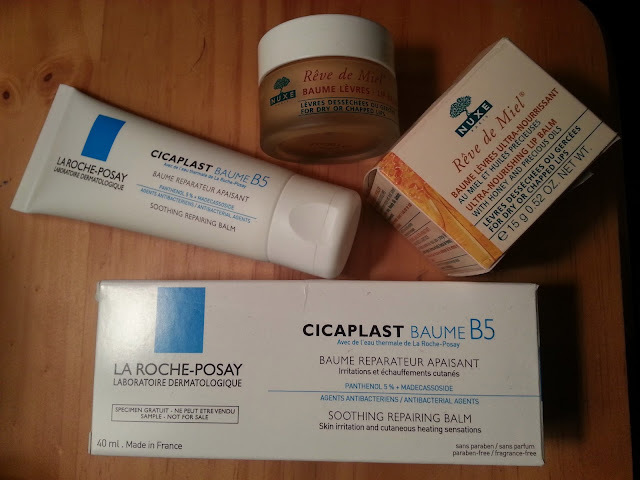 It's one of La Roch-Posay's best selling products - an all-purpose repairing balm you can use anywhere you have dry irritated skin. I use this on my lips at night if they're looking red and swollen. It helps calm them down and bring them back to normality by the morning. I layer on quite a thick, white layer - so it's generally not something I do if I have company. It's also very good on any patches of dry skin you may have. So if like me the weather is taking its toll on your lips, why not throw them a life line?! These are my lip saviors, what are yours?